Bali doesn’t really have an off season with year round waves depending on the location that you place yourself around the island. Catering from beginner to professional surfers with sand bottom beach breaks through to heavy hollow reef breaks, Bali has a range of waves for any level of surfer. 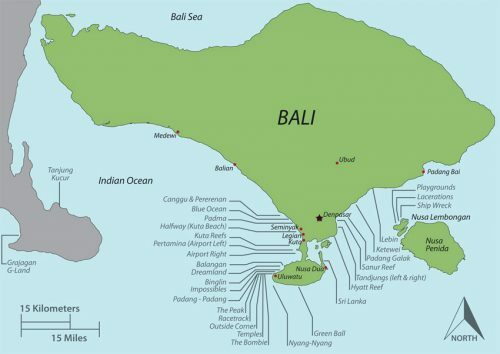 The dry Winter season running from early June to late August is generally offshore along the west coast from Kuta to Uluwatu with the South East tradewinds. Between seasons can be less predictable but there are usually offshore winds somewhere on the island. 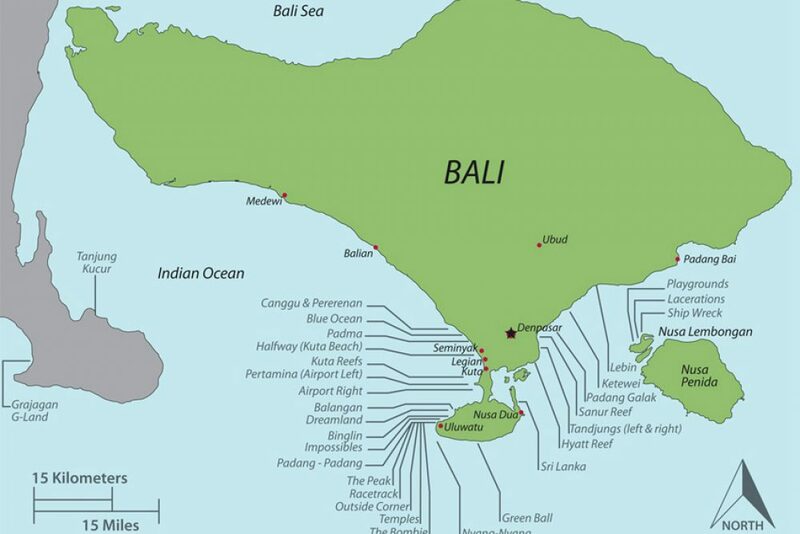 Medewi is located around 2-3hrs drive north west along the coast from Kuta. The traffic is usually very heavy and slow so we would advise leaving as early as possible. There are plenty of rivers mouths all along coast on the way which usually have minimal crowds and fun waves. This wave is usually always busy and when its good is extremely crowded. There is usually a mix of beginner, intermediate and advance surfers in the water and can be quite difficult negotiating the crowd. Once again Airport Rights is pretty straight forward. This is the right hander on the southern side of the runway at Tuban Airport. It cannot be seen from Kuta. Once again you must pay a local boat operator to drop you out to the break and pick you up but it will usually cost a little more as its further offshore. There are a few different waves here depending on the tide and swell size. – There is also a right hander on the north end of the beach that breaks in front of the headland on the right swell and tide. Impossibles is a long left hander and has 3 main sections which breaks up the crowds. On a good day with the right swell and wind all 3 sections can link up and you can get the ride of your life through to the end section of Bingin which is more then a 600m away. This wave is very fast and heavy and breaks over a sharp shallow reef and works best on a mid tide with a big swell to link up the 3 sections. This is a long right hander with a good hollow barrel end section into the channel. Best before and after low tide and breaks over a shallow reef. Recommended for intermediate to advance surfers only. A couple of very fun lefts and rights best surfed on a low tide with a decent swell. Breaks over reef and is usually very long and fast recommended for intermediate to advance surfers.